For many of us, we dabble here and there in Edwardian styles, though many of us probably don't don a corset and walking skirt for our everyday wear. Edwardian styles, it seems to me, are some of those that are gorgeous to drool over in pictures, but it's a bit fussy to work into everyday life. 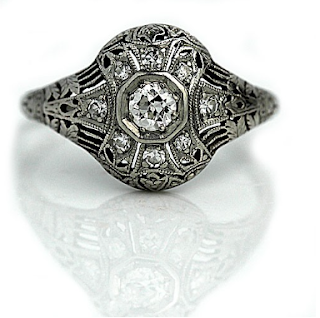 However, Edwardian jewelry is an easy way to add the beautiful delicacy of that era into a modern-vintage wardrobe! The beautiful pieces from this period are timelessly beautiful, so they fit with any era you may be particularly fond of. For this post I'm using examples of jewelry from vintagediamondring.com, so if there's anything you REALLY love... it's not a museum piece; it's actually possible to add to your wardrobe! The Edwardian era is named for King Edward of Britain. His reign began in 1901, and this is considered the beginning of the Edwardian period, with dates ranging from 1914-1920 being considered the end of the period. During this time, the aesthetics and morals of the Victorian era were beginning to encounter the progress and change brought about in the early 20th century. New inventions were changing the world, and there was hope in the air. Victorian femininity and decorum were still important, and this was reflected in the jewelry. Many jewelry pieces retained this Victorian sophistication and mixed it with classic motifs from Roman, Greek, French Baroque, and Napoleonic influences that were popular at the time. 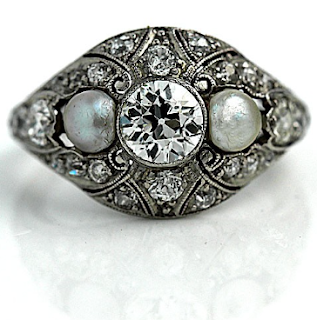 Classiness and sophistication were the order of the day, so you'll find a lot of Edwardian pieces that feature diamonds and pearls, prized for their beautiful simplicity. Platinum was also introduced into jewelry at this time. Being lightweight but strong, jewelers were able to make low-profile, minimal settings that allowed the gems themselves to shine. White on white or monochromatic combinations were popular. Scrolls, wreaths, ribbons, and flower garlands in flowing arrangements are common in Edwardian jewelry, too. Oftentimes there's an overall dainty feeling in Edwardian pieces, sometimes achieved through filigree or other delicate work. 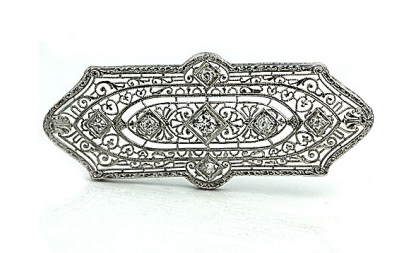 Do you own any Edwardian jewelry? What do you think of it? Do you like the delicate details, or does it seem a bit fussy for your liking? My engagement ring is one! 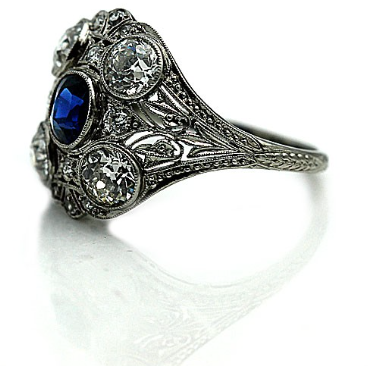 Or rather, it's a vintage re-cast of an Edwardian ring. I bought it on etsy from Tennessee Treasures, I believe. I love it so much! Much of my jewelry is very streamlined and simple for every day usage, and this ring is so glitzy and pretty it gives me a feminine squee everytime I see it! I think it's a pretty simple way to add a lot of beauty to daily life. Ooo, that sounds GORGEOUS!!! How fabulous! I do have something! My Grandmother recently gave me a turn-of-the-century belt/dress clip. It had belonged to my Great-Grandmother (my Grandpa's mom) and was given to her as a wedding present. It's beautiful - a very large oval, with etched floral designs on the ends and across the middle are lines that look like waves in the sea. The details are so tiny I almost need a magnifier to see them. My Grandma was actually considering selling this for scrap metal money! Now, I'm planning an authentic outfit to be able to wear the belt pin again. As this is my only piece of Edwardian accessory, my opinion is limited but I think it's designs are very detailed and have a rich, but low key, elegance. That sounds SO amazingly lovely! If you ever put a picture of it up anywhere, I'd love to see it! I agree, they are delicately sweet, but not frou frou like earlier pieces.